Lucy and I have been doing mommy/daughter dates since school started. I feel like she thinks she's missing out on time with me now that she's in school all day. So now, I have been trying to make sure that we do things together, just us, at least once a week. There is this little tea place that we both enjoy going to, Lucy likes it because they have very tasty treats, I like it because I really like their tea. We both like it because they keep conversation cards on the table. We get to ask each other silly little questions that strike up good conversation between us. So it made sense for me to make a list of questions to have at the house that we could use around dinner time too! And because I love them so much I wanted to share them with you! 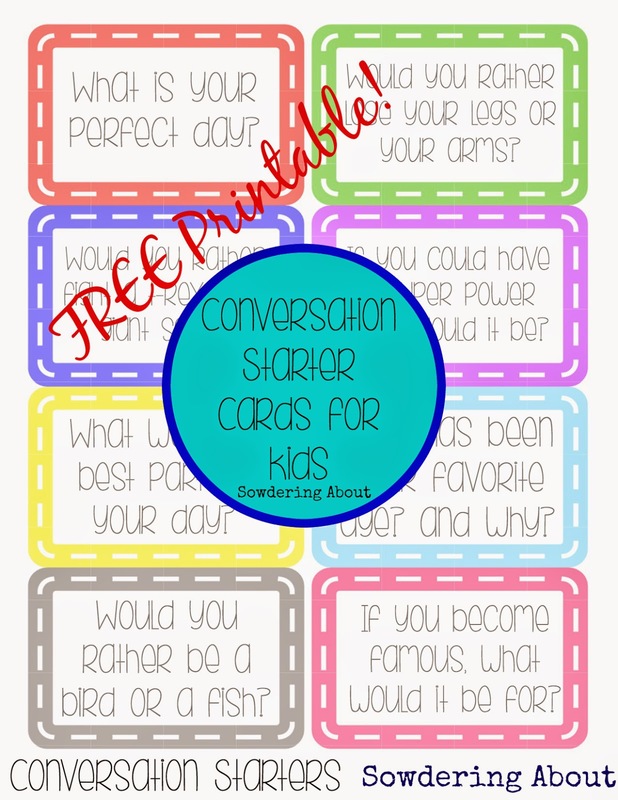 Do you have any thought provoking questions that you would like to see on conversation cards?